Beau's - Barrels of fun! Beau's All Natural Brewing Company released four limited, barrel-aged beers last week that were only available at select LCBOs spread across the Ottawa region. Fortunately for me, one of them was not far from my workplace so I picked up all four on Friday. The first thing you notice is the wrapping. I've seen it compared to opening Christmas presents. This one was on of my favourites. It poured a cloudy, dark ruby red brown, with a cream head that lingered. The aroma was hobby and fruity. I couldn't pinpoint exactly what fruit until I let my daughter smell it for her opinion. Immediately, she said "prunes" and I think she was right. I also picked up an alcohol aroma that reminded me of rubbing alcohol. The taste was a light rum with a slight alcohol burn, perhaps because it was a healthy 8.9% ABV. Overall, I really enjoyed this. I've tasted other beers aged in rum barrels and this was by far the smoothest one for me. Aged in red ice wine barrels. It poured a cloudy golden colour, with very foamy off white head. You can see in the photo that there was a lot of it, and how it dissipated. The aroma was pepper, and orange which reminded me a lot of wheat beers that I enjoy so much. The flavour was similar. Pepper, orange, wheaty, and smooth. Overall, another one that I enjoyed very much. At 10.2% ABV, it's probably not a good idea to enjoy too many of them at once. To say this was my least favourite would be a disservice. I'm not a big fan of ginger beers to begin with, but this one was pretty good. The colour was a cloudy copper, and like the Siduri, it had a very foamy head, and lacing. The aroma was ginger, with a hint of chocolate. The taste was a little hoppy, and the ginger was pretty light — lighter than other ginger beers I've tried. Despite being aged in rum barrels, I didn't pick up an rum flavour. Perhaps it was hiding behind the ginger? This had the lowest ABV of all four, at 6%. Overall, I did enjoy it. For me, this was more like a beer, whereas other ginger beers I've tried were closer to being a pop drink. This was my second favourite. If you're a wine lover, you might enjoy this one. The color was a light golden orange. There was very little carbonation, which made me think of wine. The taste was smooth, with a light orange peel flavour. The taste also reminded me of wine. It's no wonder it's called a "wheat wine". The ABV was the second highest at 9.8%. Overall, really nice. I think this could make a great dinner wine substitute for beer lovers, or perhaps allow a wine lover to explore the craft beer world. 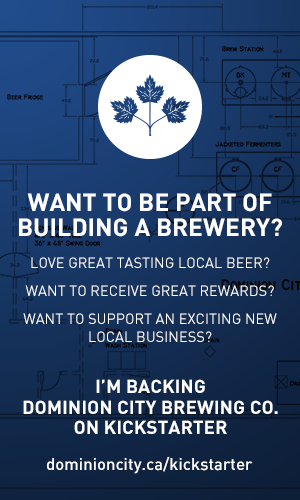 Want to help build a brewery? Earlier this week, Dominion City Brewing Co. posted a tweet about their upcoming Kickstarter campaign, along with a sketch of what would appear to be the inside of their store, once it's completed this year. Their campaign went live this morning. There are 25 pledge levels from $1, where they will sing your name into a pot of boiling wort, all the way up to $8000 where they will help you to develop, brew, and sell your very own recipe. The money will be used to "Make our brewery’s bottle shop and tasting bar as unique as our beer." I'm anxious to see them open since they're located in my neighbourhood. That's closer than my local beer store. That's a good thing. You can find more information about the campaign and all pledge levels on the Dominion City Brewing Co. Kickstarter page. I discovered this product today: FastRack. I currently use a bottle tree, and while it works pretty good, I'm always paranoid about contaminants getting inside the bottle from the tree. The price ranges anywhere from $22.99 up to $33.99. The best price I could find online was at OntarioBeerKegs.com, at $22.99 so that's where I ordered it from. Their shipping was a few bucks more than another site, but the overall price was still less. My only concern about the product is how well it works with swing-top bottles, which I have many of. I'll post my findings once it arrives. I don't know how it happened, but I completely missed the blog's birthday on February 28th. The name didn't come until later. We have over 13,500 page views since. Thanks for following! It didn't take long before I managed to get my hands on a bottle from one of the nearby LCBOs. I should have picked up a few. Sham Bock from Railway City Brewing Company. The color was a very dark ruby red, with a creamy light brown head. I didn't detect any lacing as it was enjoying it. I had difficulty detecting the aroma at first. Chocolate? Perhaps it was too cold or I lost my sense of smell. My wife said it reminded her of a stout. Chocolate. As it warmed up in my glass it did give off hints of other aromas. A little butterscotch, caramel, toffee, and something fruity. There were light molasses, chocolate, and coffee flavours. It was slightly bitter with a light carbonation so it was smooth drinking, ending with a light bitter finish. Overall, I have to say this was a tough beer to review. I think I need to raise the temperature of my fridge a little, or let my beverages sit for 5-10 minutes before opening. I need to find a couple more bottles for St. Patrick's Day. Spin Dive Summer Gose by Lake of Bays Brewing Co. The Barley’s Angels – Ottawa Are Back! All content is owned by me, unless specified otherwise. Any beer logos and/or trademarks are owned by their respective owners.